Beans are naturally gluten-free. However, many people with celiac disease or non-celiac gluten sensitivity report that beans make them sick. While it's possible to be sensitive to beans, in many cases the problem for those with celiac and gluten sensitivity is not the beans themselves. Instead, it's gluten cross-contamination in the beans. Beans, of course, are well-known for causing gas and potentially other stomach discomfort, such as bloating. But those who have been gluten-free for a long time generally can tell the difference between that type of reaction and a gluten reaction. People who are particularly sensitive to trace gluten are at higher risk for having gluten reactions they trace to beans, but the problem potentially can affect everyone in the gluten-free community. In fact, it's not unusual for someone to report that they found a grain kernel that looks like barley in their beans... even in beans that are labeled gluten-free, although that problem has lessened somewhat since the U.S. Food and Drug Administration issued regulations on gluten-free labeling. Beans—especially lentils, but also all other varieties of legume—frequently are grown in the same fields in rotation with gluten grains. 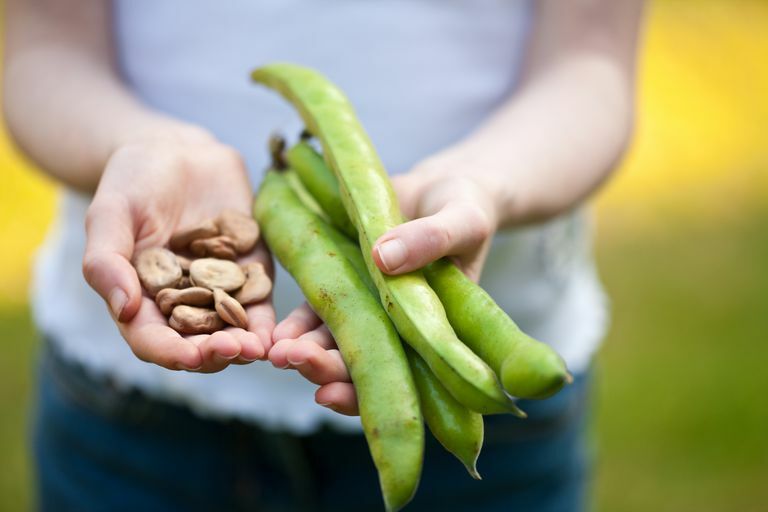 As I describe in my article on sourcing gluten-free beans, lentils often are paired with barley, while farmers alternate their crops of garbanzo beans and green peas with wheat. They then use the same equipment to harvest both. The problem is, these practices are pervasive at the farm level. Therefore, even certified gluten-free suppliers can't always guarantee the purity of their products—they only can guarantee that the beans haven't been exposed to gluten once they've arrived at their certified facility. Otherwise, they're at the mercy of the farmers who grow and harvest the raw product. Many distributors ask questions aimed at weeding out problematic farming practices, but cross-contaminated crops still can get through. This isn't a theoretical problem: I've had reports of grains of barley in bags of certified gluten-free lentils, and sporadic emails about whole gluten grains in other beans. And if there are whole grains, you can bet there's plenty of grain dust you can't see, but which can be enough to make you react. Can Washing The Beans De-Gluten Them? You might think you could simply wash off those traces of gluten grains, and I've seen others in the gluten-free community advise folks that just running your beans under a stream of cold water should be enough to purify them. However, informal experiments using home gluten testing kits show it's not that easy to get rid of the contamination—some seems to remain behind, despite your best scrubbing efforts. The problem is, gluten is a very sticky molecule, and it's just not very responsive to washing. Friends who also happen to be scientists have experimented with this, and have found you can lessen—although not eliminate—the gluten cross-contamination in beans by washing them repeatedly in water with dish soap, and then rinsing. You don't need to eliminate beans from your diet because of this problem. In fact, it's not actually a problem for everyone. For example, if you can pick the croutons off a salad before eating it and not get glutened, then you likely can enjoy all the beans you want without reacting, since you're not particularly sensitive to trace gluten. If you've been enjoying beans and you're not suffering from glutening symptoms afterward, then add beans to your list of things you just don't need to worry about. However, if you find you do react to beans, there are good options for safe beans for those who are more sensitive than average to trace gluten. Washing beans with soap might be enough to forestall a glutening for someone who's somewhat, but not extremely, sensitive to trace gluten. But if you're especially sensitive to trace gluten (if, for example, you react to most grain-based foods and processed foods), washing might lessen your reaction to cross-contaminated beans, but you're unlikely to eliminate it. You also can avoid bean varieties that are more likely to contain stray gluten grains. These include lentils (extremely cross-contaminated, in my experience) and green peas. Larger beans (garbanzo beans and giant white beans, for example) may be less susceptible to gluten cross-contamination (and it would be harder for those stray gluten grains to hide in them, as well). Finally, consider finding a local farm that harvests beans by hand. If you have one nearby, talk to the farmer directly about how they grow and handle the beans. Some farms grow only one or two types of beans, such as butter beans, and don't sow them in fields they use for other crops. If you find this type of farm, consider buying a large amount of beans and then freezing them or drying them. So, you don't need to give up beans if you're very sensitive to gluten... but you may need to put some extra effort into sourcing and preparing safe options.